A major association of the Gorkhas today demanded that a national level movement has to be organised to achieve the demand for Gorkhaland, a separate state for the Gorkhas in Darjeeling hills. KOHIMA: A major association of the Gorkhas today demanded that a national level movement has to be organised to achieve the demand for Gorkhaland, a separate state for the Gorkhas in Darjeeling hills. The issue of separate state for Gorkhas is not only for the Gorkhas of Darjeeling but it is for the Gorkhas spread across the country, said National Spokesperson of Gorkhaland Sanyukta Sangharsh Samity (GSSS), Anjali Sharma Bhujel. "We have to prove that the Gorkhas in every corner of India supports the Gorkhaland movement," she said adding that the issue of separate Gorkhaland state has to be unitedly taken up at the national level. "The Government of India will not be able to ignore the national level movement, and therefore we need to knit a common thread and sent a strong message to the Centre and Government of West Bengal that Gorkhas will continue to protect their pride and rights," Bhujel said. She was addressing a coordination meeting of the GSSS in which members of the Nagaland Gorkha Association took part. "We will not remain silent unless and until we achieve the aspiration of the Gorkhas," she said. Anjali said GSSS is planning a 'Sansad March' to let the voice of the Gorkhas be heard by the MPs during the winter session of the Parliament. 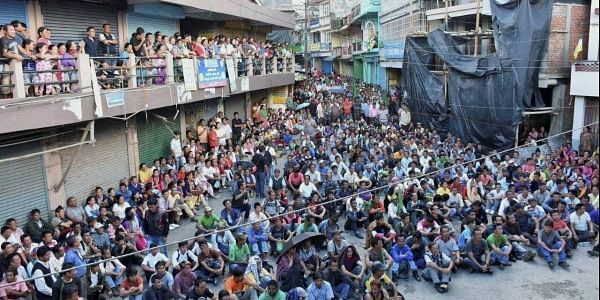 The GSSS had brought out a rally in New Delhi in July to reinforce their demand for a separate state and imposition of President's Rule in West Bengal when the Gorkhaland agitation was at its peak in Darjeeling hills.